Lian Hearn returns in top form with Emperor Of The Eight Islands. Once again, she seamlessly weaves Japanese myth and history into a brand new tale. This is a first in a series, and it features a sprawling epic, with much of the novel feeling like a prelude to an even grander story. I am already clamouring for more. Your life is not your own. You will die to one life and rise to another, to become what you are meant to be. At the heart of The Tale of Shikanoko lies the intrinsic relationship between man and nature. Inspired by ancient Japanese myth and beliefs, much of the magic contained in this novel is tied to animals and natural landscape. These creatures seem ubiquitous in the world of Shikanoko: firstly, with the titular character himself being reborn with the death of a deer. There’s also the Prince Abbott, using werehawks as his spies. A lord’s spirit reincarnated into a foal. A whole tribe of boys born from cocoons. The book alternates between the use of creatures from Japanese myth such as the birdlike tengu – to building its own legend and spirit. The mixture creates an intoxicating and lush landscape, where men walk the fine boundaries between myth and reality. This dance unlocks the secrets of the forest and releases its blessings. It is a powerful link between the three worlds of animals, humans and spirits. I felt the setting tied flawlessly with the traditional Japanese Shinto faith, where kami – sacred spirits – are found in all sources of life: wind, trees, animals, mountain, sea. This relationship is seen by the numerous torii gates scattered through Japan, marking the boundaries between the sacred world and our own. It is seen in the way deers populate important spiritual sites, as they were once considered messenger from the gods. 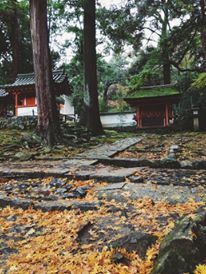 Even the very shrine temple and buildings blend thoughtfully into nature. Reading this book gave me serious nostalgia for Nara – one of my favourite places in Japan. Along with its complex set of myth, the Tale of Shikanoko also follow a sprawling and epic fictious landscape embroiled in political strife. Numerous warlords clash as they vie to place the rightful emperor onto the Lotus Throne. In Book One alone, we see: Brothers turned enemies. Seemingly delicate noblewomen taking hold of their own destiny. Numerous betrayals and even more murders. The story is truly grand in scope, covering numerous holdings and following a varied host of characters. For the first quarter of the book, I got whiplash from trying to keep up with all the new names and locations – thankfully, there’s a list of names and a map at the beginning of the book! The characters themselves are unique – each with their own motivation and angle in the story, making this glossary quickly redundant as I familiarised myself with them. A man is at his most dangerous when he senses his powers begin to slip from him. The plot of Emperor Of The Eight Islands is constantly on the move, with much of its cast constantly on the move as some depart from the storyline and others moving to take their place. Aside from the titular Shikanoko being guaranteed some modicum of safety – all the other characters are on the block, making the plot just as unpredictable as true history. I loved seeing younger characters growing confidence and figuring out where they fit on the grand puzzle of the Eight Islands. Similarly, it was exciting to see which of the older characters helped them reach their full potential – and the intricate web of relationships that weaved them all together. The Emperor Of The Eight Islands is one of those rare books where I am more invested in the storyline. While the characters are complex, I felt removed from their feelings and emotion – even those of main characters like Shikanoko and Akihime. Perhaps it’s due to the fairy-tale like quality of the writing, but I felt the character filled out roles, yet never stepped off the pages. While I was always eager to see what they will do next – I did not particularly care when any of them perished. The closest I came to loving the character was my admiration for the fortitude and loyalty of Akihime. I also confess to liking the younger generation: Yoshimori, the cocoon boys, Kai (please return, Kai! ), and Hina more than the older cast – so hopefully they’ll take more of the limelight in the second novel. I felt my connection to the younger cast of character was largely due to their affinity to the natural world – and the more mystical elements of the story. The potential for drama and crazy hijinks with their storyline is immense, and I can’t wait to see it unfold in Lord Of The Darkwood. For now, I’ll have to return to where it all began and read the Tale of Otori while waiting for the next book. As I have previously done in my other Japan-related book reviews, here’s a quick glimpse at my trip from last year and how it related to this novel! With a title like Shikanoko (meaning Deer’s Child) – it’s little wonder I was reminded of Nara while reading this book. 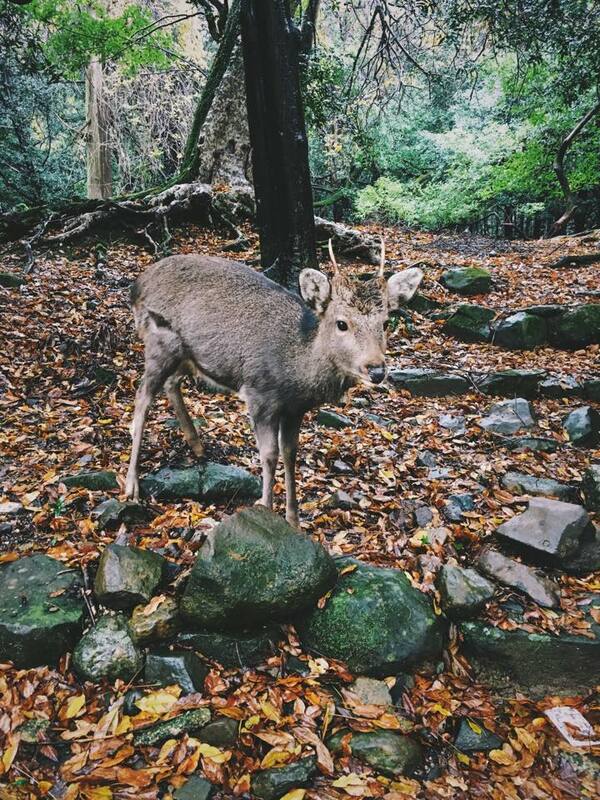 As mentioned, this is one of my favourite location in Japan, mainly because of the deceptively adorable deers. I say deceptive because I got chased down by a horde of them the last time I visited (my only crime: carrying around an inviting sweet potato). There’s little more magical than walking through an ancient city, mingling with animals and nature. 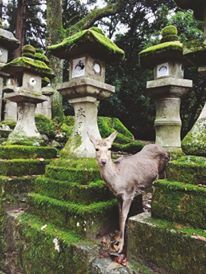 While the main part of Nara (around the park and Todaiji) is often packed with people – a little wandering will lead you away from the pack of tourists and lead you to some truly magical and isolated spots. 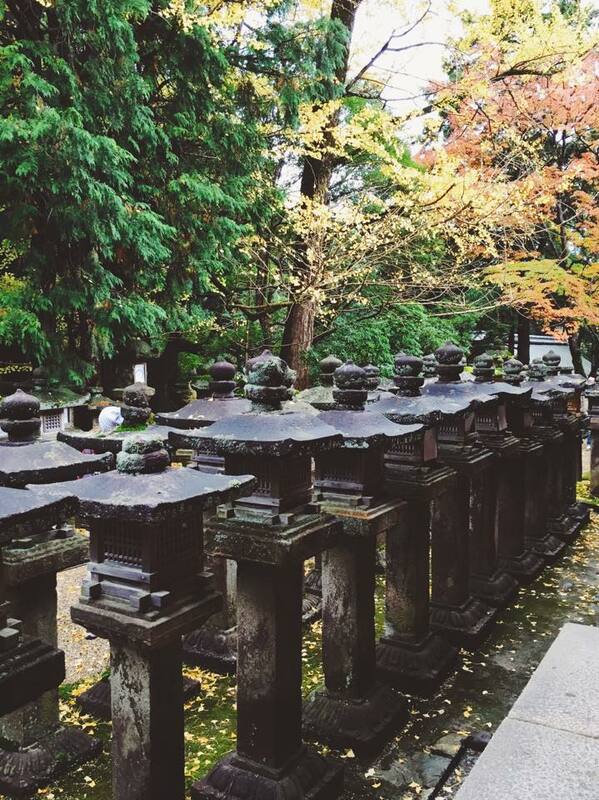 One of my favourite is the Kasuga Taisha temple – famed for all its different types of lantern. The older one was called Akihime, the Autumn Princess, because she had been born in the autumn, the same month as now when the maples were turning scarlet and the gingko tree bt the gate dropped swathes of golden leaves. Akihime is my favourite character in this book – and she is named for my favourite season. Every season in Japan is an event – but I feel there’s none more spectacular than autumn. I might even go to admit I think it looks more beautiful than cherry blossoms *le gasp* I love the richness of the colours and the crisp cold wind that stir golden leaves. If you had to pick a season to visit Japan, pick autumn, you won’t regret it! Pictured above is the autumn foliage I saw last year in Tofukuji, Eikando and Jojakkoji of Kyoto. What a nice tie-in, very creative! Enjoyed your review! This sounds truly epic, in every sense of the word. And it also seems like the author has done accurate research with an apt portrayal of Japanese elements (instead of those books that throw in a couple of Asian-sounding words and fancy swords and call it Japanese). OMG, I’ve been to Nara before and those deer are spawn of the devil, let me tell you. *shakes head* But oh, this book sounds like SUCH lush worldbuilding! I don’t think I’d mind flatter characters if it had a lovely plot, but hmm, the way you describe this makes me think of YA Game of Thrones in Japan. I bet reading these books makes you so nostalgic for your trip. Your photos are beautiful. This book sounds wonderful. I get what you mean about feeling sort of detached from the characters. I sometimes find that in fairy tales too.I suppose sometimes it might be because the characters stand for something more than being someone, if that makes any sense. Your reviews are great; I really enjoy reading them. The Emperor of the Eight Islands sounds absolutely amazing. I really want to read it now, and visit Japan. Japan is one of the places I would love to go to; mainly to Kyoto and Tokyo. I’m so glad you enjoyed the Japanese mythology in this novel, it all sounds beautiful and breath taking! And my favourite part is those photos at the end along with your journey in Nara and Todaiji. You make me want to go back to Japan for a visit!